Vidya is an Indian girl in the 1940's with a close knit family. Vidya's father is a doctor and she has a mother and a brother. It is during a march when her father helps a woman who has been thrashed by the British soldiers that he is in turn, viciously beaten and is no longer a vibrant doctor but dependent on his family for his every need. Vidya's family must go live with her father's family, work long hours and endure insults and slurs. Vidya once wanted to attend school and even though this seems impossible now, she longs to get an education, which leads her to get permission from her grandfather to "climb the stairs" and spend time reading in the library. Vidya also brings her baby neice while she pores over the many wonderful books. She also meets Raman who seems to like the same books and leads to many long conversations. Her brother decides to go into the army and fight and is banished from his grandfather's home. Vidya can't understand why he is forsaking her and the family. Will Vidya be able to hold onto her dream of becoming educated and bettering the world like her father, or will she be married off in an arranged marriage? 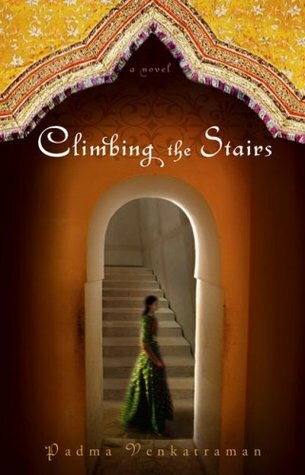 Sign into Goodreads to see if any of your friends have read Climbing the Stairs. I love the premise behind this book, education being a saving grace for a subdued woman. And I love books that re-introduce me to another culture. I have read other books set in the East and Middle East, and I never tire of learning more from another bright author about these rich cultures. I loved this book and it is a Reading Olympic book. I had a really great review and I guess I didn't save it, argh! So I had to rewrite this one quickly and I am not happy with it, but it is a wonderful read!